Measurements: Frequency, Period, Count totalization, Time interval, Duty factor, Pulse width, Freq. range, Burst freq. With the CNT-85 and CNT-85R frequency counters and calibrators, Pendulum offers the ultimate tools for stationary as well as portable calibration of frequency, from DC to over 8 GHz. These counters are designed for on-site calibration of the master clock in GSM base stations, offering a TUR of >50 over a 10 year period. They also fit on the R&D bench, in the calibration lab or in manufacturing test systems where fast and accurate frequency measurements are needed. 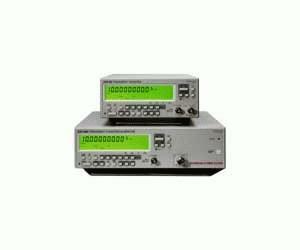 Choose between the economy model CNT-85 and the ultimate CNT-85R including a built-in Rubidium time-base reference. The CNT-85 frequency counter from Pendulum brings cal lab accuracy to field measurements. With the (optional) ultra-stable oven timebase and a high 10 digits resolution in just one second, it delivers high-accuracy measurements instantly. An overflow mode displays also the 11th and 12th digits, when needed. The CNT-85 is easy to use, compact and has a unique, smart automatic input triggering for any type of signal. A very short warm-up time of the oven oscillator, gives you ppb-performance after only 10 minutes.